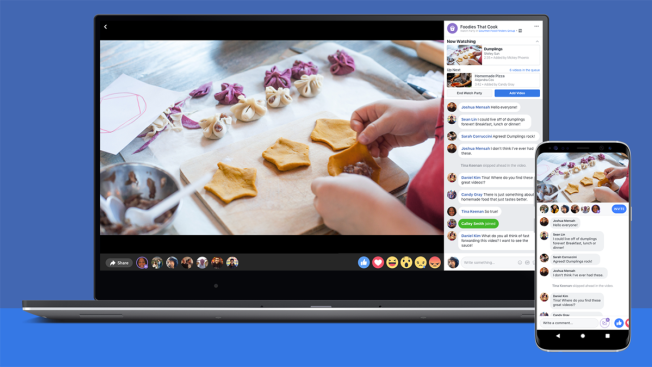 Facebook's new Watch Party feature is displayed on a laptop and phone. A new Facebook feature that debuted Wednesday enables members of a group to watch and interact with the same video simultaneously. The tool, called Watch Party and inspired by the social media site’s live feature, allows members of a Facebook group to watch, comment and react to any public video on Facebook at the same time, the company said in a news release. Facebook's livestreaming feature lets users provide commentary during a live video. Watch Party applies that concept to non-live videos of any length. “We want [the video-viewing process on Facebook] to be a shared, participatory and interactive experience," said Erin Connolly, Facebook’s social video product lead. Watch Party, which the network had been testing since January, is only available to users in groups. However, the feature will be added as an option for Facebook profiles and pages in the coming months, Connolly told NBC. Watch Party is available for Facebook’s desktop and mobile users. Moderators select a video and post it in the group to begin a watch party. Once someone in the group joins the watch party, the same video that others are watching is displayed. The moderator can continue adding videos to the queue. The original Watch Party host also has the ability to pause the video. Others watching can suggest videos for members of the Watch Party to view. Facebook anticipates the Watch Party feature will be used for things like hosting Q&A sessions, learning workout techniques and sharing tips. It was popular during the Royal Wedding, Connolly said, and can be used for members of a group to interact during a live sporting event broadcast on the social network. Facebook is also experimenting with a possible addition to Watch Party that would allow viewers to speak while the video is playing.